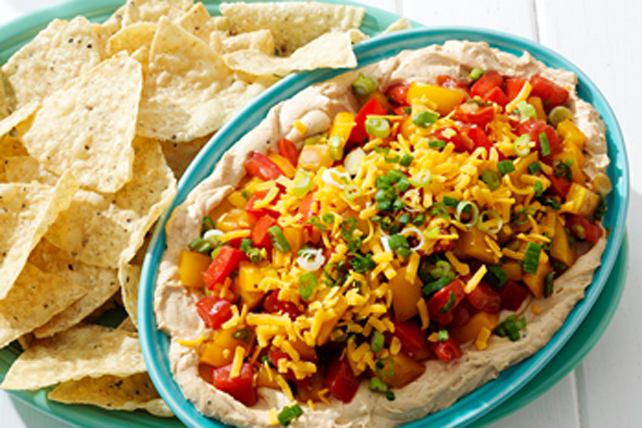 This zesty spin on the classic layered dip is sure to become a new family favourite. It's equally delicious whether enjoyed at home or at a potluck. Mix cream cheese, sour cream, cumin, lemon zest, black pepper and half the barbecue sauce until blended; spread onto bottom of 11x7-inch dish. Combine tomatoes, yellow peppers and half the onions; spoon over cream cheese mixture. Sprinkle with cheddar and remaining onions. This delicious cold dip can be partially prepared ahead of time. Mix cream cheese mixture and spread onto bottom of dish as directed. Combine tomato mixture as directed. Refrigerate both separately up to 4 hours before spooning tomato mixture over cream cheese mixture just before serving. Sprinkle with cheddar and remaining onions. Prepare using your favourite flavour of Diana BBQ Sauce, such as Gourmet Original, and/or another variety of Cracker Barrel Shredded Cheese, such as Tex Mex or Double Cheddar.